I am happy to see that the creators are willing to take a chance and not just retell the story that was told so many times. I agree with people that this seems like an alternative universe, where some events went diffrently then the manga, and I love the potential. I love how they humanized Light and gave him flaws and he is more relateble, you can see the strugle hes going through. Now I will be honest, I personaly never liked how L looked in the Manga/Anime. I personaly love this change they made to him but thats up to the individual, some people say that he does not eat sweets anymore, I don't know where that is coming from because you do see him eat sweets and finally also other stuff. (Try to survive on candy alone, I always wondered what L's dentist bill was in the manga.) As for Misa I love how she fits in to the story and her backround. After being a rather big fan of Death Note, both manga, anime, and the LA films, I watched this with some trepidation at first. But it grew on me. Think of it like an AU version, where Light's mother died, and his father threw himself into his work, causing Light to, instead of being over-the-top intelligent, withdrawn, and have a rather large ego, he had to take on the roll of a parent, No cram school for him, no gallivanting off with his fathers partners to solve crimes. Instead this seems to take place about a year after he gets out of high school, instead of his final year. It starts off with Light in a concert with a friend featuring Misa Misa, but like in the manga, he seems completely uninterested in her. It then hints at his intelligence by his friend saying that he has always had top grades, but never really applied himself. In this version Light also is not aiming to be a Police officer, rather a generic public servant, although I could have missed something there. He doesn't seem to have as big of a sense of justice as the manga version, but rather that of an ordinary person who has seen the darker side of the world. Now as for L, I just cant pin down why he seems so different. Is it the fact that in only one day he goes and shows his face to Yagami? The lack of constant sweets? His slightly egotistical approach to the whole thing? It is different but that doesn't make it bad. The characters have the same names, but that's it. Get ready to have a new story told. It doesn't feel the same. Why would anyone want a retelling of the original? I love the original and I've seen the whole thing about three times. If you miss it, then just watch it again. However, If you love the idea of a parallel universe where small changes lead to crazy new outcomes, then give this a try. It could be fun to watch for awhile. It's watchable. The graphics are campy. But it's no where near as intriguing or fulfilling as the anime or manga. You could even say that it does the anime and manga injustice. Kira (Light Yagami) is made into a trigger-happy room temperature IQ protagonist who has no concept of preparation or timing. L is [struggling to be (i.e. trying and failing)] portrayed as an enigmatic genius. The characters are ridiculously dumbed and washed down in this adaptation and the plot lacks the depth that the anime and manga offered freely. I'm not impressed. Don't except to be, either. An interesting take on the Death Note universe. I am so glad they decided to take this risk and not try to retread the same story we've seen in the comic and the anime, yet people are still gonna complain because it's not the same, anyways the the protagonist is quite the contrast from the Light Yagami we all knew,(which in my opinion makes him more down to earth, which kinda adds an extra layer to his character) although presented in a different way the crucial events are somewhat similar, also L personality has also changed which like light with a different personality. Now in terms of cinematography it does the job, but from other reviews i've read they mentioned that the lighting wasn't up to par, which i would have to agree, but i guess ill have to forgive this show. The CG isn't really problematic since its Just Ryuk receiving that treatment and terms of music, i liked it. The actor the portrays this version of Light Yagami, "Masataka Kubota" does a really good job displaying his acting chops, you feel for him and his trepidation at using the Death Note and the struggles he deals with. In terms of first episode, i think it was good, but hopefully the show delivers on great character progression and also hopefully we get see the potato chip scene again, JK. This show isn't good, as a deathnote remake/re-imagining. If you think of it on it's own, making Light less smart than in the original takes the whole theme out of the show. There is a likely chance that throughout the show L will be winning the whole time. Light was so stupid in the way he went about things. The L from the original series/movies/manga/light novel would have had case closed in a matter of minutes. Light seriously just walks up to Matsuda and asks him a question about the case, then the next day he changes his patterns. This case would be open-shut if L just asked the police team if they told anyone about the case. Like a fanfiction come to life! When I first heard that Death Note had been translated into a Drama I thought for sure that this would be a epic fail. But, curiosity overruled the part of my brain that was sure this would be a waste of time and now I am incredibly glad I watched this. This was like watching a AU fanfic come to life, with how they changed Light Yagami's character and the very large changes to the overall story. One of the changes that really stood out to me in a good way that I actually quite enjoyed was the combining of Mello and Near into one person, a change that I though was very creative and only enhanced the changed storyline that this drama follows. Another thing I highly appreciated was the way they portrayed L. Through the drama portrayal of this character I found myself actually understanding the resentment that his fellow Taskforce members held towards him, the personality that could rub just about anyone the wrong way and the disregard of the lives of some of the victims for the sake of ending the case. The only thing I was not fond of was the way that the story seemed to almost dumb him down in a way, thus the reason he ended up dying. While the characters intelligence did seem to be lowered, I found that it did not turn me away from the drama because of the enhanced emotional side of all the main characters that really added intensity to this drama. The only thing that really irritated me is that Ryuk went from a smart and almost cunning but bored Shinigami that I really quite liked to a almost idiotic fangirl that relied on crude language and volume to get his point across. I was not a fan of the drama portrayal and he is the only reason this is four stars rather then five. Not impressed with drama Ryuk at all. 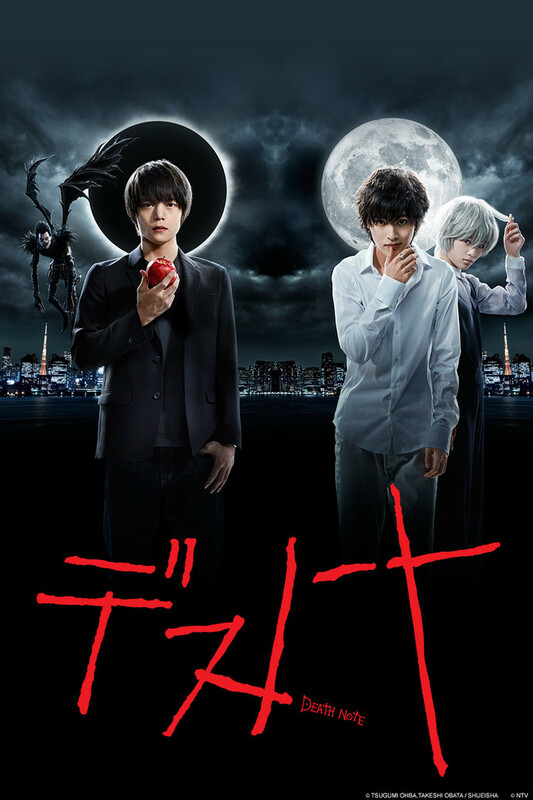 Overall I highly, highly enjoyed this drama and would recommend it to anyone who either is a fan of Death Note already, or who loves crime/supernatural. The only caution I would give is not to go into this expecting it to look like the manga/anime because this deviates almost entirely from the original storyline, but if you go in expecting something like a fanfic brought to life I'm positive you'll enjoy this. I thoroughly enjoyed this drama throughout the whole time watching episode 1, yes there is a few things that do occasionally bugged me while watching but I sincerely think that anyone reading this should give it a go because it is amazing and definitely a 5 star. Surprisingly Captivating. Finished in almost one day. First off, seriously think twice about all the naysayers of this show. Yes this is a slightly different interpretation of Death Note, but were you honestly expecting it to be some carbon copy of the original manga? Is that really what you want? That's what we have the anime for, lol. Secondly, I'm a big fan of the manga, anime and original live action movies. And I can honestly say that this series improves on the live action movies greatly. It always bugged me in the original movies how they glossed over certain arcs and totally eclipsed Near & Mello at the end in favor of a cleaner, tighter ending. But with this show the time they take really pays off. Thirdly, the acting was surprisingly good! Especially the actor who played Light. This dude has some range & nuance that I seldom see from Japanese TV actors. I love the changes and chances the series took with Light's backstory & character. He's way more sympathetic, but never loses that sinister edge about him. I understood his motivation for using the Death Note way more and I felt a lot more invested in his character emotionally. I'll admit, L did seem a little bit off to me at first, and the choices they made with Near & Mello were really weird, but it all eventually grew on me and I ended up really liking the end result. The show covered all the awesome arcs & scenes that I was looking for (i.e. potato chip scene, jail surveilance scene, Light & L working together/fighting, Mello & Near arc, etc...), so I ultimately ended up extremely satisfied. Ryuk & Rem didn't have the best Cgi, but it didn't ruin the show for me. The show's not perfect but I still loved it. As unfaithful as the show was in some respects it was incredibly faithful in even more respects, especially when compared to the live action Movies. Give the show a try. If you love Death Note, but have seen all the other interpretations a million times like I have, lol, you should love this version as well ;). Unfortunately this doesn't compare to the Anime at all, the whole "doing good, by killing bad people is overshadowed by Light's desire to just beat L. The character all have their creep factor leveled up to 10 which is super fake. The twists are not well present like in the anime either.